Brand name fashion is available at huge discounts at Foxtown, the largest factory outlet shopping mall in Switzerland, near Lugano in Ticino. Shoppers travel from Milan in Italy to save and enjoy cheap bargains. 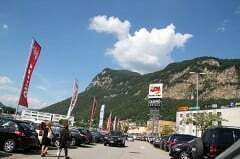 Bargain hunters can enjoy huge savings and find cheap deals on designer brands and topline fashion at Foxtown Factory Stores in Mendrisio in Ticino in Southern Switzerland near Lugano, Como, and Milan. 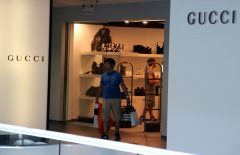 Top brands include CK Jeans, CK Underwear, Dior, Dolce&Gabanna, Fendi, Ferrari, Gucci, Hugo Boss, Prada, and Versace. Casual wear is well represented too as it sportswear including Adidas, Nike, Puma, and Solomon. Foxtown factory outlet mall is open 7 days per week and can easily be reach by car, train, or shuttle bus excursions from various parts of Switzerland and Italy, including from Milan. Foxtown Factory Stores is the largest outlet shopping mall in Switzerland with around 160 shops. 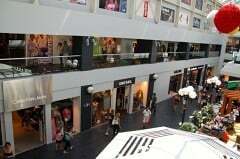 Apart from being open on Sunday, the mall surprises most with its astonishing range of high end fashion brands. Many of these designer fashion brands are not often seen in factory outlet shopping malls at other locations. High Fashion at Foxtown Factory Stores include Armani, Burberry, Cerruti, Dior, Dolce&Gabanna, Escada, Fendi, Gucci, Hugo Boss, Iceberg, Jil Sander, Missoni, Prada, Salvatore Ferragamo, Valentino, and Versace. Quality shoes are also available from Bally and Tod’s. 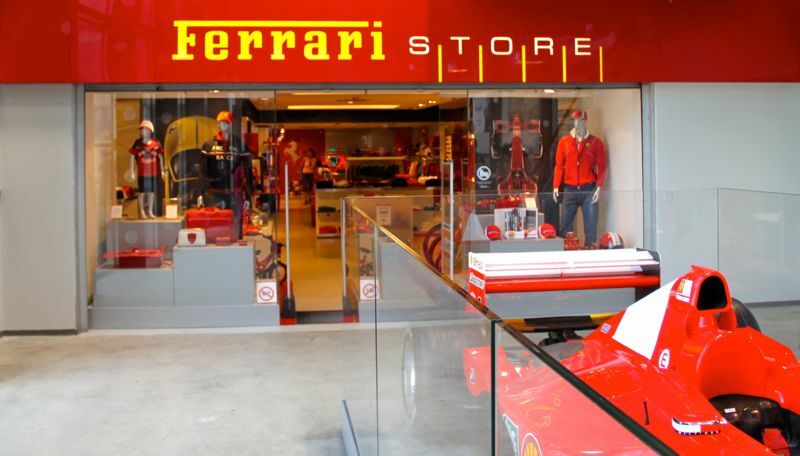 A lovely surprise is a Ferrari factory outlet store with huge savings – not on the cars of course, but on Ferrari branded clothes, shoes, and accessories. One of Michael Schumacher’s winning F1 cars is on display in front of the store. Grab a map on arrival – the layout of the mall is slightly confusing at first and it will be easy to miss a large part of the mall if only following the main circular walkway. Shoppers arriving early are not only rewarded with the standard discounts ranging from 30 to 70% but also very easy parking. Later on a busy weekend, the parking garages do fill up. Food and drink is available from various cafés and mostly self-service outlets but the quality is fairly good. The Chalet Suisse restaurant serves fondue and other Swiss classics. Adults may gamble in the onsite Admiral Casino. Getting to Foxtown Factory Stores is very easy by car, train, or shuttle bus. If driving, use the Milano-Lugano highway and exit at Mendrisio – signs point to the mall, which is very close to the highway exit. Driving distances are 15 km from Lugano, 50 km from Milan, and a mere 8 km from Como. Mendrisio is a stop on the S10 trains that run usually twice per hour through Ticino – traveling time is around 20 minutes from Lugano and 50 minutes from Bellinzona. From Milano, change in Chiasso for journey time as short as an hour. Foxtown is a 15-minute walk from Mendrisio train station – a bus service is also available. If arriving by train or postal bus in Switzerland enquire about RailAway offers, which can give discounts on the journey to Mendrisio and special savings at the outlet mall. Shuttle bus services are available daily from Milan and Bergamo to Foxtown outlet mall. Other group tours can also be arranged.